A year after arguably the most successful year local sports teams have ever had, 2017 turned out to be almost equally as strong. A number of athletes and teams achieved many things to be proud. This is a review of the top 10 teams of 2017 from Burbank and Burroughs highs. The Bulldogs may have not won a Pacific League title, but their postseason run was nothing short of amazing. 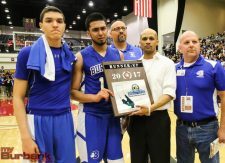 Burbank finished with a 25-10 record and came as close to winning as a CIF title as one could have, losing only by one point on an off-balance 3-pointer at the buzzer against Brentwood. In its playoff run, the Bulldogs defeated teams few gave them a chance of winning. Burbank defeated La Sierra of Riverside, followed by second seeded Crean Lutheran and then Rancho Mirage, whose shortest starter was as tall as Burbank’s tallest. The Bulldogs also rallied from a 13-point deficit against Rancho Mirage. Michael Woods was the leader of the group of seniors who had played together for several years, ultimately resulting in arguably the best season in school history. A year after getting to the CIF championship game, Burbank was hit hard by losses to graduation. But the Bulldogs still had a small core that knew what it was like to win. This team, unlike the team a year ago, went on to win the Pacific League title under first-year coach Adam Colman. Burbank also knocked off top-seeded South Hills during its playoff run before falling to Don Lugo in the CIF semifinals. The Bulldogs have a lot of talent coming back for next season, so this team has lots to look forward to in 2018. The Indians put together a stellar season as longtime head coach Mike Kodama earned his 10th league title. Burroughs went 19-5-4 overall and 11-2-1 in league. The Indians won a pair of CIF Southern Section Division 3 playoff matches, including one on the road and in the rain against Paso Robles. Eventually Burroughs’ run was stopped by a fine Salesian side. 10-0 in league. While the record may not look impressive, Burroughs was playing against the toughest competition out there, playing in Division 1 in the CIF playoffs. The Indians outlasted Newbury Park in the first round of the playoffs, before falling to national power Huntington Beach in the second round. The Bulldogs finished 11-5 overall and third in the tough and deep Pacific League and had to win a wild card match just to make it into the main draw. They did that and went on to win two more CIF Southern Section Division 2 playoff matches before falling to top seeded Northwood of Irvine in the quarterfinals. Led by University of Washington bound outside hitter Marin Grote, the Indians went 28-7 and captured the Pacific League title. Burroughs advanced to the second round of the CIF Southern Section Division 3 playoffs before losing to Westridge of Pasadena. The Indians went 15-9 and fought off Hoover to win the Pacific League title. A year after winning a CIF title, Burroughs moved up to Division 3, where it advanced to the second round of the playoffs before losing to Dos Pueblos of Goleta. The Indians were not as sharp as they have been in the past. Still they were able to earn a share of the Pacific League title, going 19-9 overall and 12-2 in league. 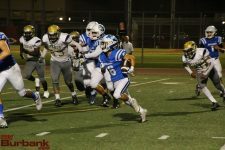 Playing in Division 1, the Indians were not so fortunate in the playoffs, losing to Oaks Christian in the first round. This very talented veteran group actually struggled for much of the season, but came on strong in Pacific League Finals to top a fine Arcadia squad for second place on the Apaches’ home course. Arcadia had defeated Burroughs in the first two league meets. Jagdeep Chahal also took home honors as the league’s individual champion. The Bulldogs went neck and neck with Burroughs all season, with Burbank taking the first league meet by a large margin. 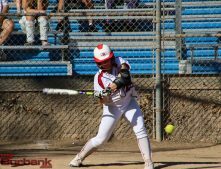 Burroughs bounced back and beat Burbank narrowly twice. But the Bulldogs make the cut here due to its qualification for CIF Finals, where Burbank finished 20th in Division 1. It was just the third time in program history that the lady Bulldogs qualified for CIF Finals. This entry was posted in Boys Basketball, Boys Soccer, Boys Volleyball, Boys Waterpolo, Cross Country, Football, Girls Basketball, Girls Volleyball, Soccer, Softball, Sports, Tennis and tagged Burbank boys basketball, Burbank Football, Burbank girls cross country, Burbank girls tennis, Burroughs boys soccer, Burroughs boys volleyball, Burroughs boys' cross country, Burroughs boys' water polo, Burroughs girls volleyball, Burroughs Softball on December 31, 2017 by Jim Riggio.